This is one of those recipes that I have made once or twice and now can't even remember where I got it from. 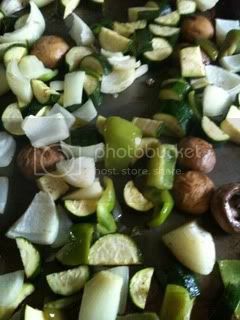 It's more like a method than a recipe...the steps are simple and the veggies can be switched out to your liking. This is the first time that I have included asparagus and mushrooms. I have only made it a few times (usually when I want to make my family feel special or when I want to impress people) because while easy and only has a few steps -- it makes a ton of dishes to wash. I clean and prep all veggies...de-stem the mushrooms, cut up onion and zucchini, and cut off the ends of the asparagus to find the woody end that needs to be cut off. Drizzle all with olive oil and sprinkle with salt and pepper. Roast at 350 degrees until tender. This usually takes about 20 minutes. Try to ignore the foil packets...I was also roasting garlic and beets separately. They were test roasting's to see if I could do it and if they were good. Take a really large bowl - this one I picked up at Wal-mart -think summer plastic. 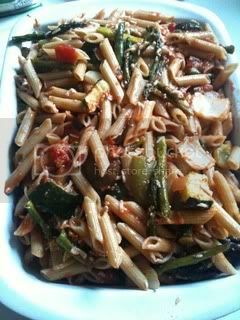 Cut roasted asparagus into bite size pieces, place all veggies in bottom of bowl, then 1 lb of pasta (this is for 6), 1 jar of spaghetti sauce, 1 cup of mozzarella cheese, and 1/2 cup of Parmesan cheese. Fold to mix all ingredients. Take spoon down the sides of the bowl coming up through the middle. 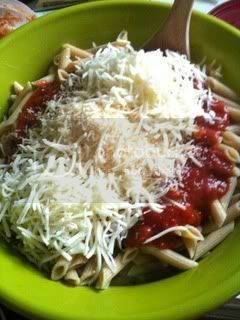 This is the easiest way to mix it all without losing it due to spillage or flying pasta. Carefully transfer to a 9 x 13 casserole dish that has been coated with non-stick cooking spray...top with 1 cup of mozzarella cheese and 1/2 cup of Parmesan cheese. 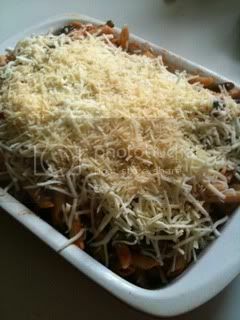 Bake at 350 degrees until cheese is hot and bubbly. This is a fabulous combination of carbs, cheese and yummy veggies...there was only a little bit left. While there were leftover's - we give it a resounding 5 spoons! 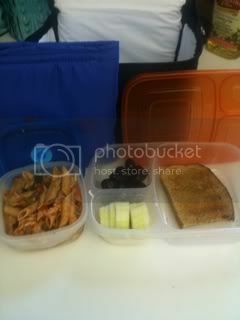 The left overs were put to good use the next day...I sent the pasta with garlic bread in their school lunches. I've always been too chicken to do roasted veggies. I'm thinking it's high time I get over that fear. Thanks for sharing this! I seriously want to make it! :) Thanks! This sounds absolutely delicious! 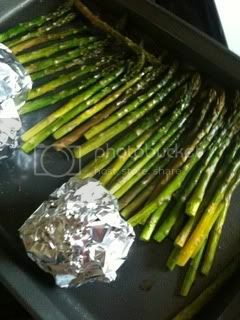 When I can harvest enough aspargus I'm giving this recipe a go. I have really been enjoying all of the recipes you ladies have been doing. This one looks especially yummy. We are pasta lovers in this family. Can't wait for the Farmer's markets to start so I can get really fresh veggies to try this one out on!